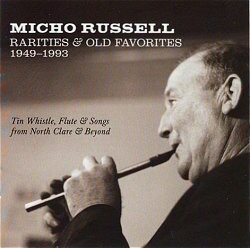 Micho Russell of Doolin, County Clare, was one of the best known and best loved whistle and flute players in recent times. A big man with a gentle demeanour he would happily sit and play a tune with anyone. He left school at 14 to work on the family farm but in the mid-1960s the folk revival gave him a new career as a professional musician. Micho died in a road traffic accident in early 1994. He was recorded extensively as well as appearing on RTE radio and television programmes. He recorded for Topic in 1974 with his two brothers, Gussie on whistle and Packie on concertina as well as making a record for Neil Wayne's Free Reed label in 1976. In the late '90s, GTD of Galway issued a set of 4 cassettes, later issued on CD, of songs and tunes. He toured Europe with The Johnstons, Clannad, De Dannan and a number of other groups. In the 1990s he toured the USA, tours organised by Bill Ochs who is responsible for this compilation which has been issued to mark the centenary of Micho's birth. Ochs has previously released the posthumous CD and VHS cassette Ireland's Whistling Ambassador and a book is planned to support this retrospective as well. This selection of tracks, with a few exceptions, offers live and other private recordings of Micho not previously available. Spread across two CDs there is just over 90 minutes of whistle playing, fluting and songs, most of it solo but some with his brother Gussie and local fiddlers Paddy Killourhy and Willie Shannon. The CD opens with the oldest surviving recording of Micho, recorded in 1949 by Seamus Ennis for Radio Eireann. Micho plays the reel Boil the Breakfast Early on a piccolo. Accompanied by his own tapping feet keeping double time, the playing is unmistakably Micho, highly rhythmical with sparse ornamentation. This style was apparently heavily influenced by the push-and-draw style of concertina playing that his mother must have employed and which is now virtually lost and these days only heard on recordings of old Clare concertina players. The few tracks with his brother or fiddlers were recorded in the 1960s at house dances and Micho's uncluttered style comes into its own as it blends so easily with the shuffling and banging feet of the set dancers. These short tracks suffer to some extent from the conversation and encouraging shouts to the dancers that go along with any house party but they are a wonderful glimpse into the rural way of life of fifty years ago. Many of the tracks come from the recordings of concerts and private sessions on Micho's trips to America from 1990 to 1993 which featured on the Ireland's Whistling Ambassador CD. There are tracks from two commercial recordings, both now out of print, one made in 1974 at the Irish Folk Festival in Germany, the other an LP released in 1982 on the Wolfe Tones' label. These are augmented with recordings made by well known collectors of the 1960s and '70s, Bill Leader and Brendan Breathnach, who collected scores of tunes from Micho and transcribed them in his Ceol Rince na hEireann books. In all these selections, whether for a festival audience or a single listener with a tape recorder, Micho puts his whole personality into the music. There is a real inner enjoyment in his own playing and it is never less than wonderful. Interestingly, Micho never recorded with any sort of accompaniment, whether commercial or otherwise, which keeps the focus firmly on his whistle playing. There is a short accompanying booklet, giving a brief background to the various recordings and comments on the significance of some of the unusual settings of tunes that Micho played, as well as rare tunes from the local repertoire. A more detailed life story and analysis of Micho's music is promised in the book Bill Ochs plans to publish later in the year. While there are many recordings of Micho already available, this CD provides a generous addition to the published canon, makes a great introduction for listeners not familiar with MIcho's playing and for the completist collector, it is worth buying for the recordings that date from the 1960s.